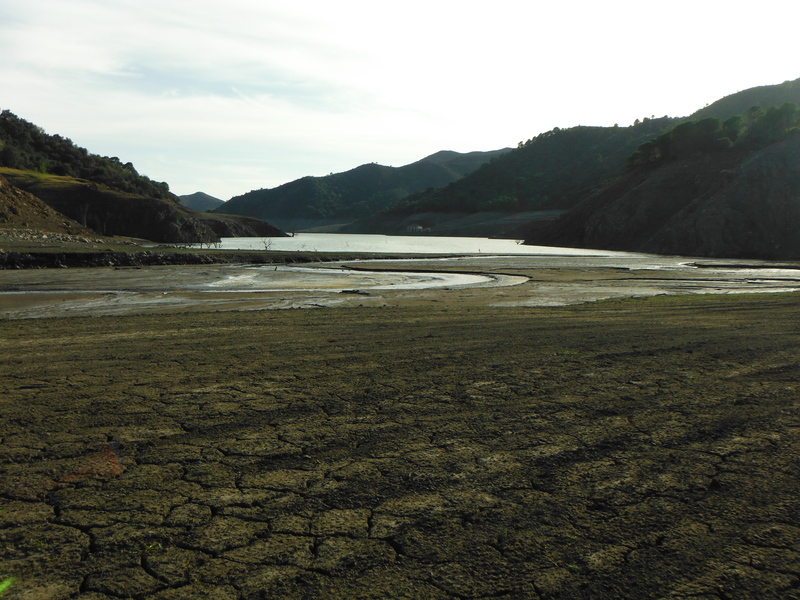 I have never seen Concepción reservoir so empty and was amazed to see, on my arrival, the exposed sediment of its floor. I suppose I ought not to have been surprised. The low levels were reported in an article published this week in the local press and which featured photos of ghost buildings which had emerged after years of immersion. 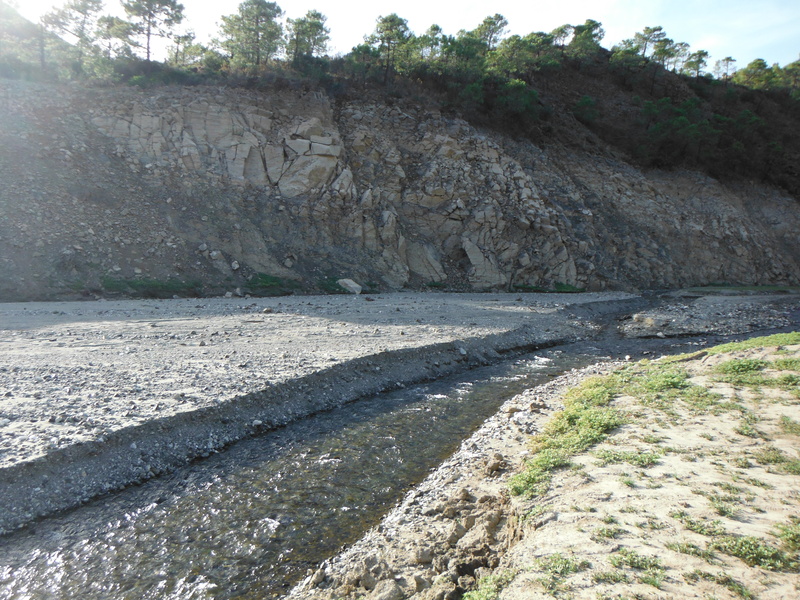 It seems that recent rains have done little to reverse the loss of water and the Río Verde which feeds the reservoir has cut a long channel through her floor and now empties its turbid water the best part of two kilometers from the position of its “old” estuary when the reservoir is full. Rather naïvely, I had intended to fish for black bass from my float tube but arrived to discover that the reservoir had retreated to the extent that it could not even be seen from where I had parked up. 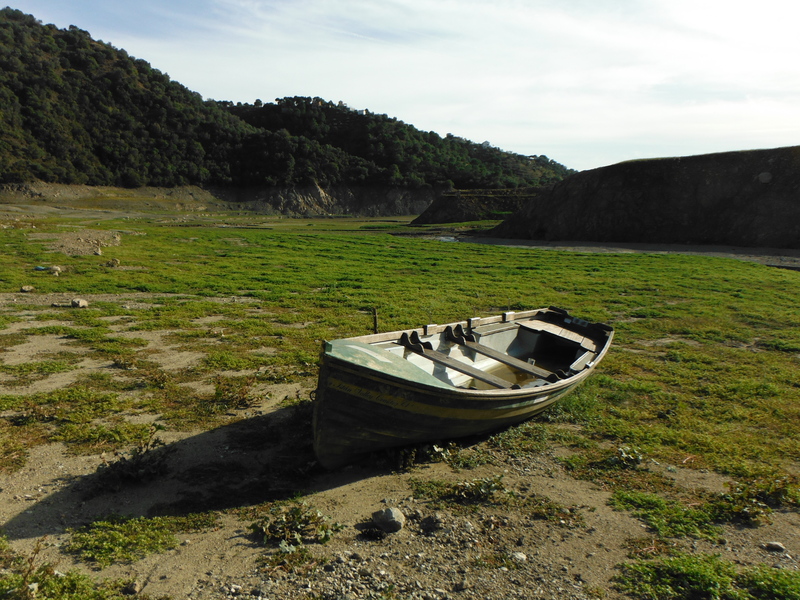 I had a similar experience several years ago when most of the Río Guadalhorce dried out and I had emerged through a dense bank of canes some after making my way through some citrus groves only to discover a goat herder and his goats and dogs standing on the dusty bed of the vanished river. 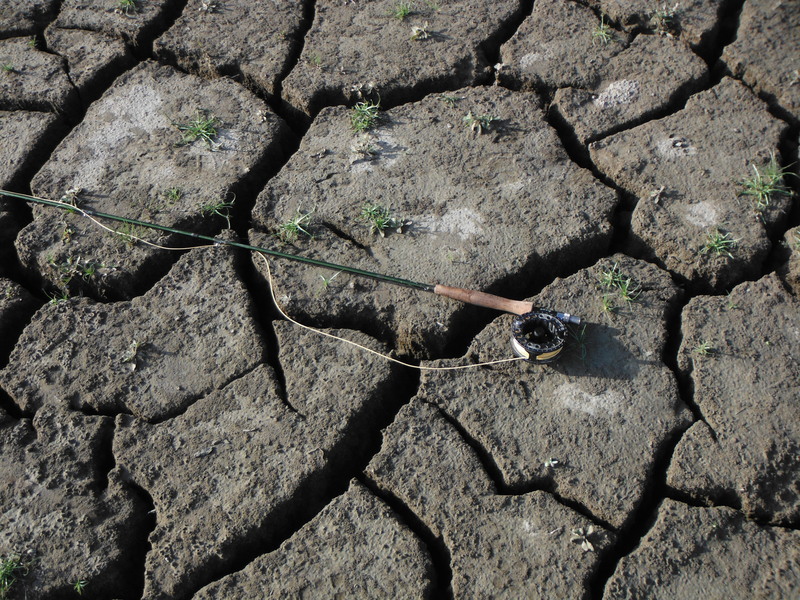 Clearly they were not expecting a guy with a fishing rod to turn up out of the blue when there was no water for miles around. They all looked at me with incredulous expressions, even the goats, and I was forced to slip away with my tail between my legs! It was quite eerie walking along the old reservoir bed. For the most part the floor is pretty level but the river channel creates a conspicuous furrow. Plants had seeded and grown and created a carpet of green over the old bed. 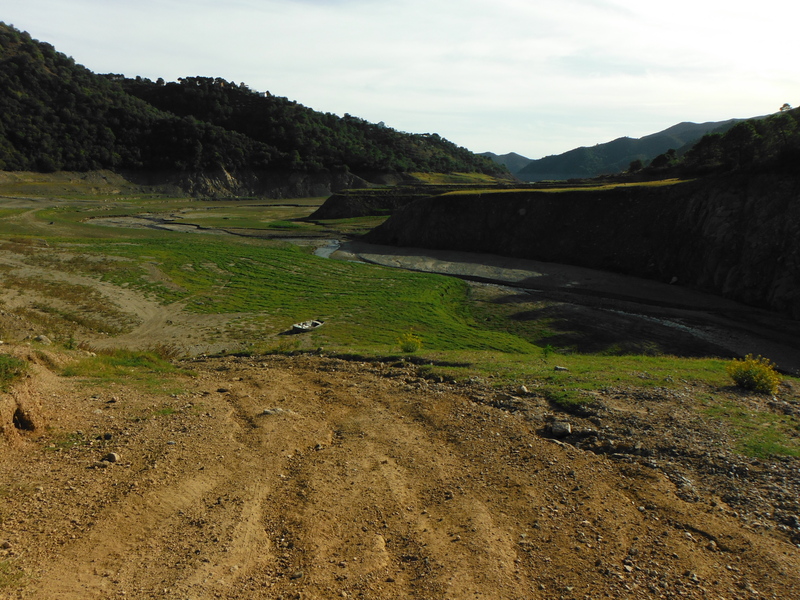 It seemed a good idea to photograph the newly-revealed topography along with features like trees which would normally be hidden, but could prove to be attractive haunts for bass when water levels return to normal. Eventually I arrived at the edge of the retreated lake. I nearly got myself stuck in some deep mud and was forced to plot an alternative route to access the shore. Upstream of the reservoir the river channel had split and the braids which coalesced into two miniature streams which deposited a stain of sediment into the reservoir. There were frequent splashing sounds coming from the banks of these shallow streams and I turned each time to locate the source. I suppose it is becomes almost instinctive to do this if you have spent a lot of time fishing since fish occasionally make such sounds in the shallow margins. 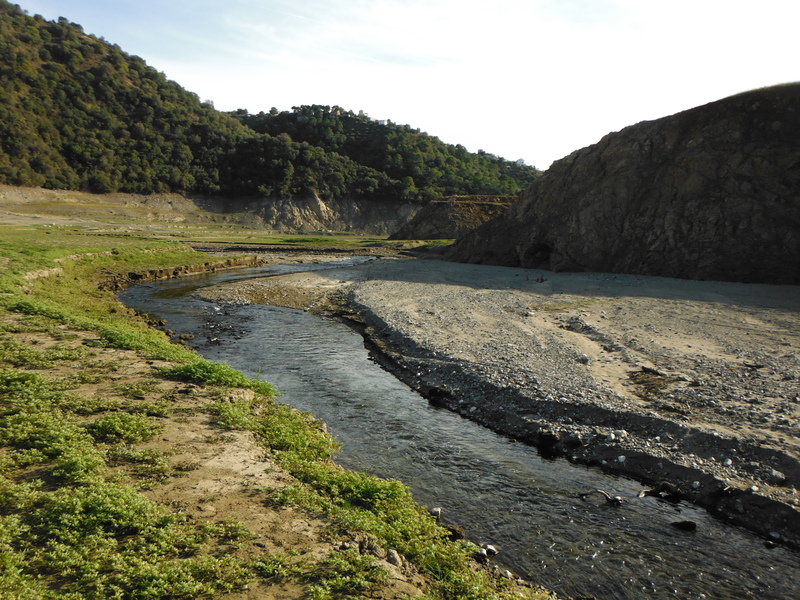 But the sounds were caused, not by fish, but by the flowing water collapsing tiny “cliffs” along the stream edges before carrying the displaced sediment downstream to create the billowing brown clouds which were swallowed by the green water of reservoir. It was extraordinary to see and hear the processes that had allowed the Río Verde to carve out a gorge in miniature. 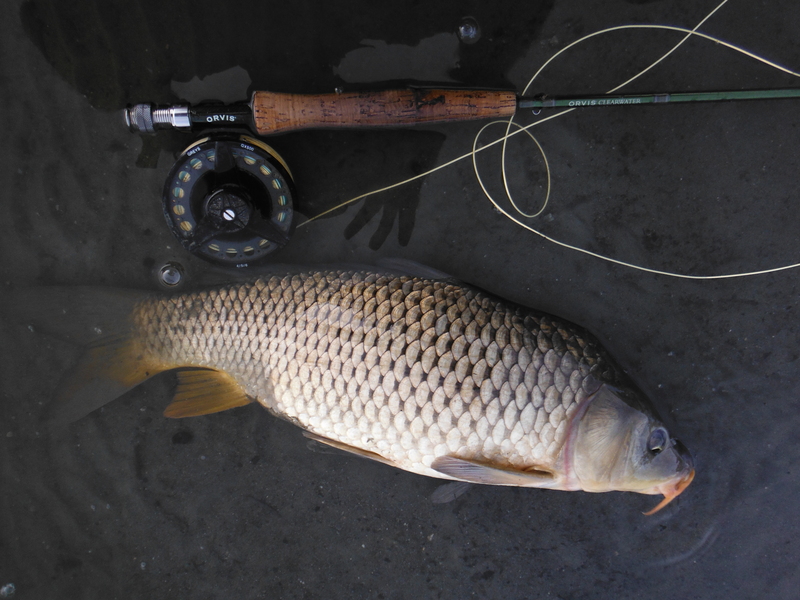 The carp and barbel drop into the reservoir from Río Verde when river levels fall but I have often found that they do not wander very far and, if the river is still flowing, they may be quite close its point of entry. It´s almost as though these fish, like migrating salmon, become holed up when river flows are inadequate but that they are impatient to move upriver when conditions allow. Yesterday the reservoir shore was carrying a little colour as we might expect because it is shallow and is subjected to an onshore wind. And of course the river was also contributing a slick of dark water. Fish spotting was never going to be easy here so I speculatively searched the dark slick and its edges with a black woolly bugger with a bead head. I was hoping the fish abandoned by the river might be holding close to the outlet and fortunately they were. 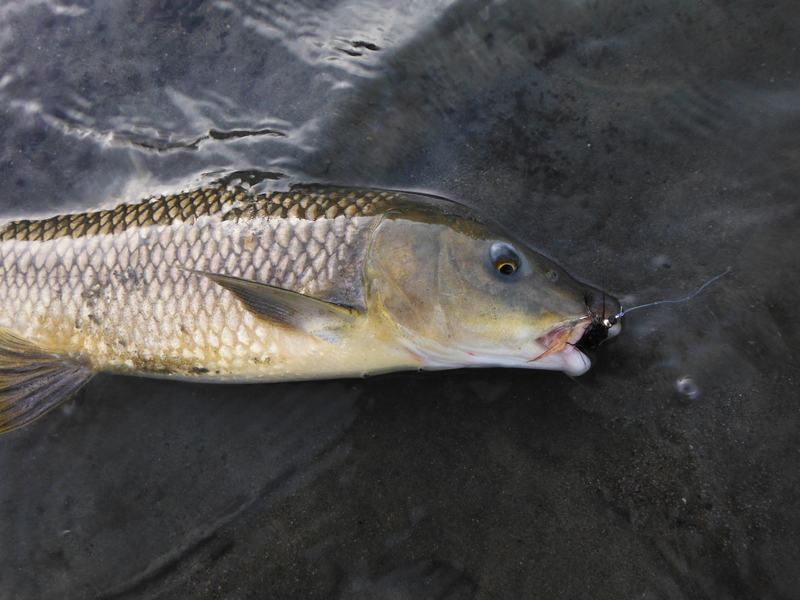 Every now and then, if things go your way, you can catch gipsy barbel, carp and black bass all on the same day at Concepcíon. This doesn´t happen often so if it does and so you can consider yourself lucky. When water levels rise again I wonder if predatory black bass will lurk in the groove carved by the river? Here and there tracks can be seen in the dried mud. I think these ones are from ibex which are can sometimes be seen in the rough terrain around the reservoir. This is the “new” estuary. I would guess that the “old” one is about 2 km away! This is one of a couple of gipsy barbel that fell for the woolly bugger. 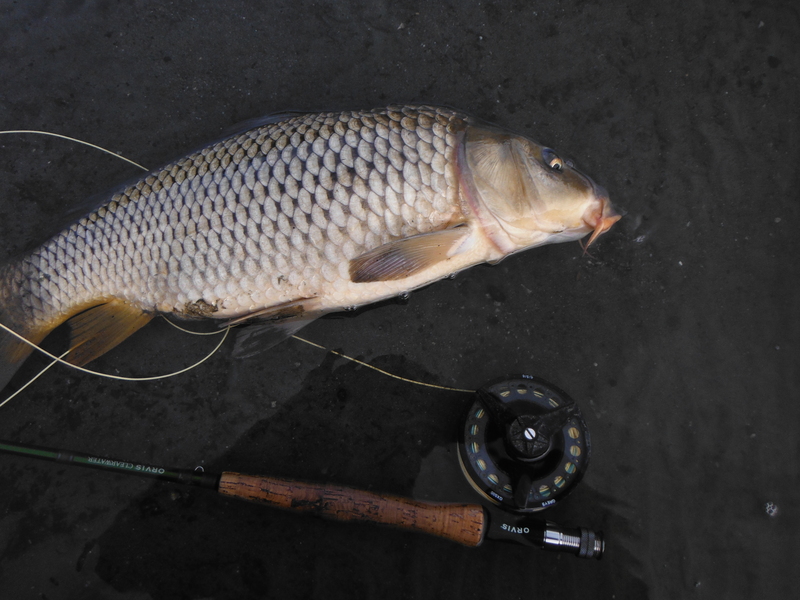 This was the best of three carp. I hooked one which I think was much bigger but it came off! Wow! Amazing to see the meadows growing where we used to fish! How come you always catch fish no matter what the conditions ? Well done, I admire your tenacity and skill.! Any sign of the locked safe we found on the lake bed some years ago when the waters had dropped back a bit ? Now that was truly a mystery! Hola Harry! Good to hear from you. No sign of the safe although I was so distracted by everything that I might have just walked past it! I think I was just fortunate with the fishing. Sight fishing was out so I just worked the old woolly bugger where I thought fish might be and thankfully there were some there. I must say I had a real blast! That’s amazing – it great how the simple act of going fishing gives us opportunity to see things like that. 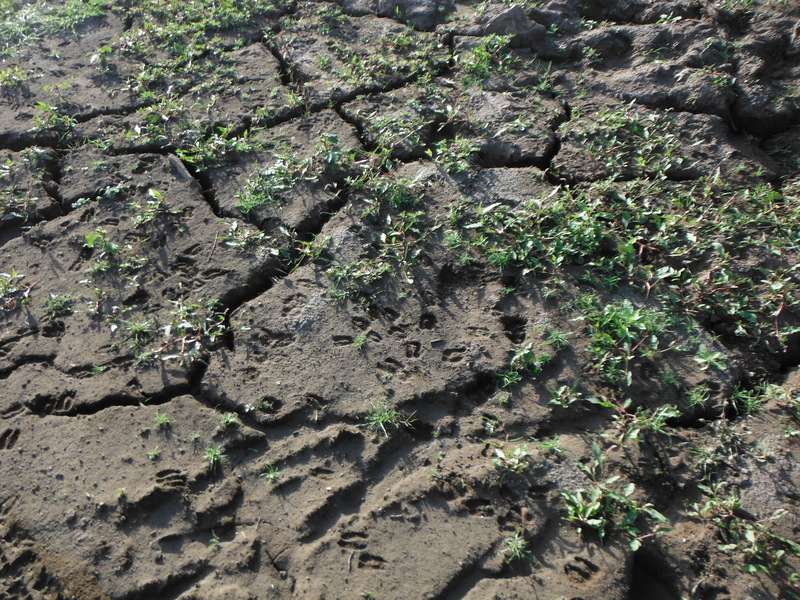 It clearly shows how dry your recent summer has been – how’s the river? I would imagine it’s similar to the state you describe in your post. It’s good to see that you don’t let a small matter such as disappearing water stop you putting some great fish on the bank, top angling – that man. It almost nailed on that I’ll be back over next year – looking forward to getting some fishing with you.